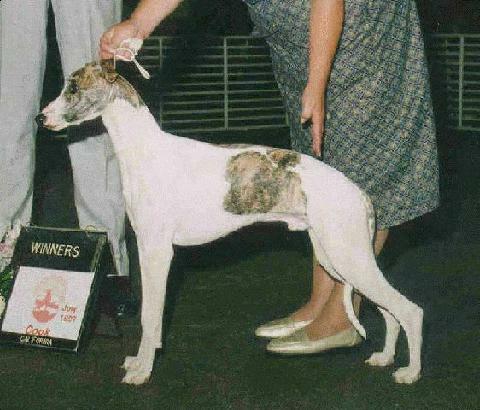 Burnie is my first show Whippet. 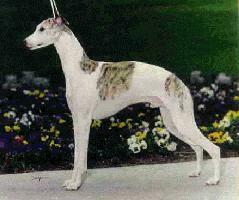 He was purchased from Kathleen Banks, Elmwind Farm, home of Hasue Whippets and was bred by Kathleen and Doris Bandoian, Vahdor Whippets. Doris also owns Burnie's father Ch. Saxon Shore's Flashpoint , Wizard. At his very first three dog shows, he was Winners Dog, all three days!! What a thrill for me to have such a great beginning in a new breed! Burnie has been show sparactically for the past year and now needs just his majors to finish. He is a bit tall for the west coast, but we are sure he will finish. Thank you Kathleen and Doris! Burnie is not the only show "star". Of the four puppies that have been shown so far, all four were pointed from the 6-9 month puppy class and one is a Canadian Champion!!! Make sure that you visit Kathleen's web page to see more of her dogs. Co-owned with George Rizzo of Sicily, Italy. 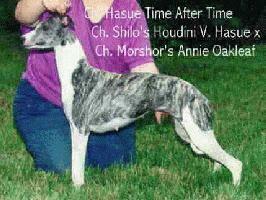 Magic just finished her Canadian championship at 7 months old. The litter co-breeder Doris Bandoian owns her.